No, I didn’t actually steal anything, but I almost feel like I have. Note the word almost. I got such amazing bargains that it almost felt like stealing. I have been working on a beast of a piece of furniture for my dining room and needed a much needed break from it. So, I did what I usually do on a sunny day when I am not working for money, I hit the charity shops! It is a form of entertainment for me and I never know if something will jump out at me and ask me to take it home. Just so you know, I actually don’t really need anything. I do have an idea to expand a piece of furniture and took some measurements before I went out, just in case I saw something I could use. I also thought it might be nice to find some interesting artwork. I am always on the lookout for a lovely painting. I don’t think you can own too much art. 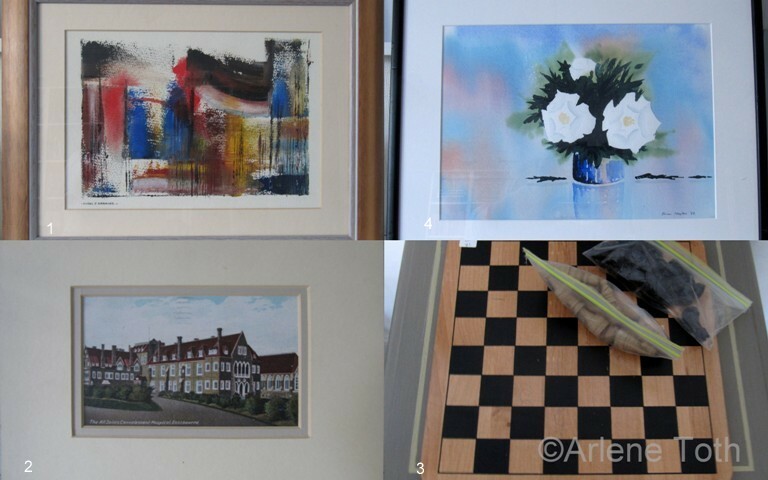 Charity shops are great places to score some nice paintings or frames. Sometimes I find nice things that I didn’t even know I wanted! Anyway, I had two intentions when I went out: I was looking for a bookcase of sorts and I was looking for artwork. 1) I couldn’t believe my eyes when I spied this painting by Nigel Greaves for £20! The picture frame is worth more than £20! And the painting is definitely worth more than that. I should know because I own one of Nigel’s paintings. I felt sick with excitement and felt like a naughty schoolgirl when I handed over my money. How this painting came to be in a charity shop I will never know. Usually, something of this worth gets given away when someone passes away and the relatives don’t like it or don’t know its value. Although other people’s abstracts are really not my thing unless your name is Kandinsky, I do like this painting and have the perfect spot for it. I still would have purchased it even if I didn’t like it. I would just stick it on E-bay otherwise. 2) This is a postcard of the All Saints Convalescent Hospital in Eastbourne and was sent to someone in London postmarked 1916. I need to find a frame for it. I like collecting historical items like this. This little gem cost £1.50! I am amazed that it found its way back to Eastbourne! The building still stands, but it has been turned into very expensive apartments. 3) I found this chess set for £2.00! This chess set is nothing special, but it is just the right size and I want to learn how to play again. I need to find a little box for the pieces. This was one of those things that I didn’t even know I wanted! 4) This painting was half price, for £2.00! It’s a pretty watercolour of ‘Christmas Roses’ by Brian Neylan. From what I could find on the internet, Brian Neylan was a resident of Eastbourne. He passed away in 2001. That was all that I could find out about this man. This painting was done in 1999. There is something really lovely and simple about this painting and I was surprised to see it going for a song. Brian may be gone, but now he won’t be forgotten. So, I now have a few more pieces to add to my collection. You never know what you are going to learn about that little gem you take home with you. What interesting things have you discovered in a charity shop? Christmas 2012 has been a bit of a wash out. Literally! It was wet, wet, wet! Last year we had snow. This year we had rain. The rain didn’t make the Christmas experience less enjoyable, but it did limit what we could do. Mainly go outside for nice long walks. I do not like to walk in the cold rain. So, after a week of horrible, wet and windy weather, we got a break! Today, on New Year’s Day, we had sunshine and hardly a cloud in the sky! Yay! After a hearty breakfast, we drove up to Beachy Head for a walk to the Belle Tout Lighthouse and back. I thought it was going to be a bit of a struggle after all the amazing food I had eaten in the last week, but it was a very nice and breezy, walk. It is amazing what a bit of sunshine can do for your spirit. On the way back to the car, we stopped into The Beachy Head Pub. 😉 Happy New Year 2013 People! Here is to another New Beginning! A Sunny Day in December! For the last two weeks I have had the pleasure of driving along the seafront on the way to work. The reason I say pleasure is that there are no two days alike, so I get to see something different every day! That certainly makes the drive to work more interesting. It isn’t practical, or safe, to pull over on the side of the road to take a photo of the frost covered fields, or the beautiful sunrises – but I managed to get out for a walk last Sunday and the weather was glorious! So, here are some reasons why I love where I live so much. No post about where I live would be complete without a photo of The Pier. I love it! As you can probably see, some other people love it too, because they are doing some work on it! Look at that wonderful sky, and the flat sea! What would the seaside be without a few fishing boats to look at? Or a few lobster pots and fishing nets? Or the annual Santa Fun Run?